Recreate the magic of one of the most popular animated movies from Walt Disney with The Lion King (Sega Genesis), a single-player platformer. 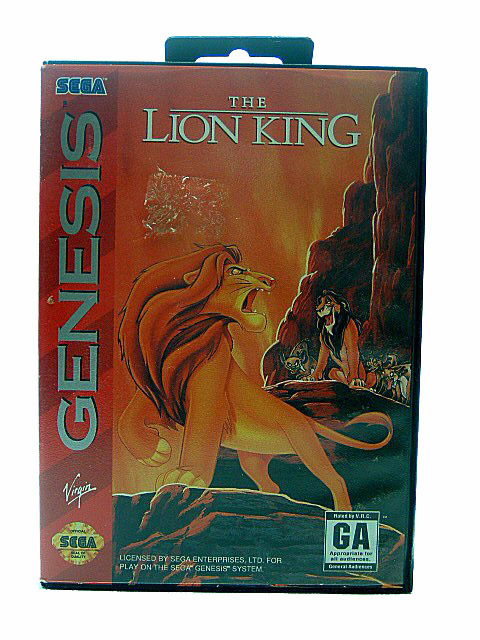 This Sega Genesis game centers on the lion Simba and takes you on his journey to win back the throne from his wicked uncle Scar. You assume the role of Simba through his cub-hood and adult-hood in the main levels. The heads-up display of this adventure video game indicates a Âroar meterÂ and Âhealth barÂ both of which determine SimbaÂs power and energy levels which can be restored by collecting bugs. In this Sega Genesis game, cub Simba can roar, jump, and roll to fight and fend off enemies, and adult Simba is stronger who can slash, maul, and throw enemies (though he cannot roll). Two bonus levels allow you to control either Timon or Pumba searching and eating bugs. This adventure video game is a side-scroller in third-person perspective and features sprites and backgrounds by Disney animators with music adapted from the film. Join Simba on his quest for adventure and fun in The Lion King (Sega Genesis) that has 10 levels of gameplay. The Circle of Life continues. High on an outcropping, the Lion King, Mufasa, holds his new-born son high in the air. Simba is born, and is destined to be the Lion King when Mufasa's time is up. Unfortunately, Mufasa's brother, Scar has other plans. Staging a wildebeest stampede, Mufasa is killed, and Simba blames himself and goes into self-imposed exile. Scar takes the mantle of the Lion King. Based on the populer Disney movie of the same name, you play Simba, the Prince of the Pridelands. You will face hyena's, an elephant graveyard, a stampede, and finally Scar as you grow from a cub, to a full-grown lion. Fight your way back to the Pridelands and reclaim what is yours, and save your family.